There are a number of key mechanisms in which measuring trade facilitation contributes to enabling trade (see Figure 4), resulting in actionable data. Trade facilitation data enables data-driven decision-making, notably in prioritizing reforms and allocating resources (see Data-driven policy-making). Furthermore, it incentivizes reforms, and allows policymakers to monitor progress. It also provides businesses with information for operating and investment decisions, and helps all stakeholders to identify good practices that can be emulated. The data gathered through these efforts is the indispensable ingredient for empirical research—including all the studies cited earlier in this chapter. Until the 1990s, attempts to measure trade frictions essentially consisted in quantifying the trade-reducing effects of crossing a border, or of geographic remoteness or distance, notably through augmented gravity models pioneered in the 1960s. But the ability to conduct and unpack a more granular analysis of the causes of the “border effect” was limited by the lack of data. By the late 1990s and early 2000s, it became clear that various non-tariff barriers contributed as much if not more than trade tariffs—which had already begun to be reduced—to explaining trade flows and patterns. Amid rapid globalization, economic integration and the development of global value chains, the need to identify and quantify these barriers that existed at as well as behind the border became more pressing. This led several organizations to launch initiatives to identify and compile data and indicators measuring these barriers (see Trade facilitation data initiatives). These new initiatives have given rise to an abundant stream of empirical literature (including the Enabling Trade Index, launched by the World Economic Forum in 2008) that has provided new insight about trade costs and the benefits of reducing them. Despite the ongoing efforts, gaps in trade facilitation data remain vast. In areas covered by existing efforts, higher frequency, more granularity, and larger scope would greatly enhance the quality of the data. The need is particularly acute in terms of actual border administration performance, as good policies (de jure) are merely necessary and not sufficient conditions to good outcomes (de facto). Figure 5 organizes the existing data collection efforts (see Trade facilitation data initiatives) into four quadrants, where data initiatives are placed along the vertical axis on the basis of their nature (primary- or transaction-level data vs perception- and opinion-based data) and along the horizontal axis according to their scope (policy/environment vs outcome/performance). The upper-right quadrant is where the gap currently lies with the only relevant initiative (i.e. the World Customs Organization’s Time Release Studies) being done on an ad hoc, periodic basis and kept, in the vast majority of cases, confidential. There is, therefore, a need for real-world, actionable and public data on trade facilitation on a global scale that can spur transparency, guide trade facilitation reform efforts and act as yardstick in tracking implementation and actual performance. In this context, the Global Alliance for Trade Facilitation has set up a Metrics and Measurements effort with activities organized into three categories: metrics development, knowledge development and knowledge diffusion. The Enabling Trade Index, co-produced by the Alliance and the Forum, is one deliverable of the Working Group. Composite indicators and benchmarking tools have proven very effective in promoting data-driven, evidence-based dialogue and policy-making, as well as creating impetus for reforms. In considering the development of new metrics, the Alliance will leverage the potential offered by business data, Big Data and technology. It will focus primarily on assessing outcomes and countries’ actual performance using disaggregated, transaction-level data through partnerships with the private sector. It will also work with governments to increase transparency around key performance indicators related to customs clearance and border procedures. Filling these gaps will in turn help increase transparency and accountability and raise awareness on the importance of trade facilitation, ultimately contributing to driving reforms. Even within the space of transaction-level, outcome-based data, the challenge of accurately measuring all the relevant aspects of trade facilitation remains. Trade is a multi-faceted, complex process involving multiple actors and using different transport modes. In light of the Alliance’s mission and consistent with the scope of the TFA, its data initiatives will focus primarily on assessing border administration performance of countries, entry points and trade corridors. Processes at a border point can vary depending on the mode of transport (e.g. sea, air, train, truck, river shipment, etc. ), the type of cargo (containerized-FCL, containerized-LCL, containerized-FCX, bulk cargo, break-bulk cargo, etc. ), the duty regime (dutiable, non-dutiable, exempt/relief, preferential, inward processing, free zone, transit, de minimis, informal, etc. ), and the product itself. Forms, procedures, inspections regimes and, ultimately, efficiency levels can vary significantly across these different scenarios. Measuring performance for so many different scenarios is a daunting task. Some organizations, such as the World Bank, have focused on one or more specific scenarios. While aiming to conduct benchmarking exercises across the largest possible number of scenarios, experts recognize the need to focus on the most relevant and realistically measurable ones. For this reason, one area where the Alliance has been focusing its data efforts is express shipping. This activity has the initial benefit of being handled typically by a single company, which, therefore, has visibility over the full shipping process, from pick-up to drop-off. For non-express shipments, the process is much more fragmented and involves multiple actors (e.g. shipping companies, freight forwarders and customs brokers). A number of express companies have agreed to share transaction-level data on incoming shipments to a set of 31 economies, including the Alliance’s target countries, G20 economies and selected trade hubs. The objective is to eventually cover more than 100 economies. Anonymised data from each providing organization will be aggregated to produce estimates (for each gateway within those countries) of the time for clearance, variance from one shipment to another, the incidence of inspections by local authorities, and share of shipments being held beyond one day. While express shipments allow the Alliance to analyse only one transport mode (air transport) and account for a relatively small portion of total merchandise trade (but for a sizeable fraction of its value), they are a key component of the global value chains of some of the most advanced manufacturing companies. In addition, despite the special arrangements that are in place for express shipping in most countries, this exercise is likely to provide a good, initial proxy for the overall relative level of trade performance of the countries. Another ongoing project under the auspices of the Alliance is the Total Transport and Logistics Costs (TTLC) study, currently being piloted in Kenya and Ghana. 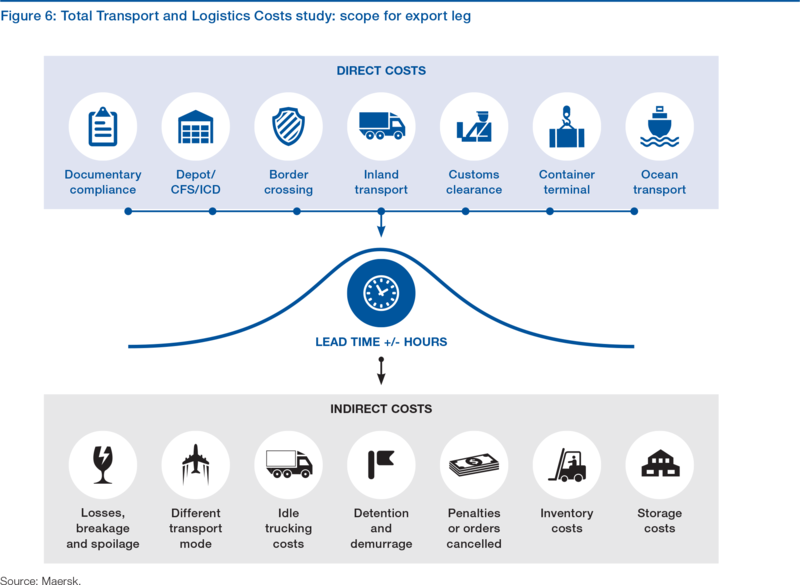 The TTLC study aims to quantify the costs of long lead times caused by inefficient border administration and frictions along the supply chains. It combines measures of indirect costs with measures of direct transport costs, tariffs and customs fees for a more comprehensive assessment of trade barriers. The TTLC study covers both export (as illustrated in Figure 6) and import processes. Long lead times and delays generate idle costs, penalties, demurrage and detention charges, extra storage and inventory costs, as well as lost orders and, eventually, lost customers. When reliability is low, importers need to keep higher inventory in order to prevent interruptions in production and/or in the supply to the customers. In some countries, such safety stock can equal one year of expected sales. Similarly, exporters can either try to ship goods days in advance to try to prevent late deliveries or they can incur penalties for late arrival and risk damaging customer relationships. The input required to deliver on such a complex assessment is of both public and proprietary nature. For instance, data on length and variation in lead times and assessments of how these factors impact indirect costs is typically not available online and therefore requires targeted data collections among stakeholders (forwarders, importers and exporters) across international supply chains. Further, considering that each supply chain is distinct, data needs to be collected separately for each good (tea, coffee, textiles, etc.) transported on a particular transport corridor. Such data collections are key parts of the practical implementation of the TTLC methodology. The TTLC’s comprehensive cost and supply chain methodological approach is critical to identifying the barriers that have the strongest impacts on competitiveness in a given context. Through this ability, the TTLC methodology is expected to enable better assessments of the potential returns from removing transport barriers and, as such, more optimal decisions on how to facilitate trade. Indicators developed under the auspices of the Alliance will be featured on the Alliance’s Trade Facilitation Dashboard. Accessible free to all, the Dashboard will be a one-stop repository of trade facilitation data, enriched by qualitative and contextual information. In the longer run, the Dashboard might serve as a channel for those governments willing to share relevant data on customs regulation and performance. The new indicators will allow for a more granular assessment of the areas directly covered by the TFA. They will also pave the way for either an enlarged border administration category in the Enabling Trade Index (see Chapter 2), or a separate composite indicator focusing exclusively on the areas covered by the TFA. The Alliance will also promote multi-stakeholder dialogue and exchange among international organizations, trade actors and experts. When possible and relevant, it will support data initiatives. OECD Trade Facilitation Indicators for Brazil and Smart statistics for intelligent progress: TRANSPark present two pilot initiatives, by the OECD and the International Road Transport Union, respectively. 17 Northern Corridor Trade Observatory (http://top.ttcanc.org/).